Tim Bumb’s Zephyr Cove home is a paradise for his 20 grandchildren, aged infant to 20 years old. It sits on the Tahoe shoreline, kayaks at the ready. The home is large enough to house the entire family, with an oversized entertain­ ment room featuring a custom-built shuffleboard table, four guest rooms and, topping it all, a bunk room that can sleep 12 with its own bath. It is also built to suit another purpose. “I wanted to keep the grandchildren as far away from me as I could,” Bumb says, laughing. 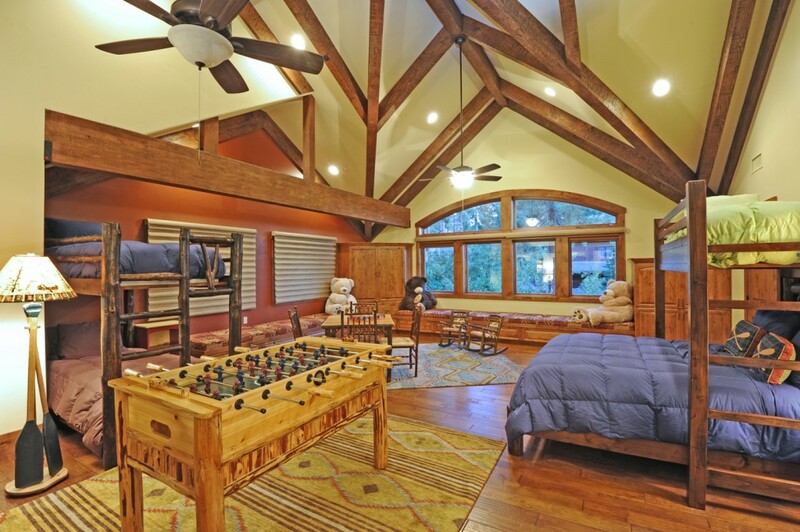 He and wife Jennifer’s master suite lies at the opposite end of the home.The 480-square-foot bunk room is a homage to cousin­ bonding, with four sets of bunk beds and additional bench seating that converts to beds. There’s a foosball table, card/ game table and large-screen TV. Bumb’s vision of a multigenerational retreat was inspired by a similar space his parents created for his group of seven siblings at a ranch home in Hollister, California. He turned to Brian Shinault Architecture and its operations manager, Eric W. Shinault, to design the home. Shinault worked in concert with interior decorators Joyce Bowman and Sandra French of Interior Motives to hand off a very detailed floor and building plan to Barry Lease of Incline Builders. Despite the home’s nearly 7,000 square foot size, Lease and his team finished the project in about a year. Hand-scraped hickory hardwood flooring runs throughout the bunk room under a ceiling accented by reclaimed lumber beams from Idaho. Reds and yellows accent the room, its rugs and furnishings; “lively colors,” Bowman calls them. An attached bathroom includes a low-profile toilet and easily reachable surfaces. The bunkroom’s own staircase descends to its mudroom, which opens onto The Lake. Beautifully executed and conceived, these guest quarters have helped create a family retreat par excellence, a place where sending children to their room is no punishment at all.